Adult Day Services (ADS) is a wonderful program of personalized care for adults who are physically, socially, emotionally and mentally challenged, or frail due to advanced age. ADS helps older people maintain their independence by providing stimulating activities including daily exercise and craft projects. We offer an opportunity for our clients to shop for themselves with outing to the local Wal-Mart and K-Mart. Adult Day Services also gives family caregivers a break from their daily care giving routine, allows them to shop, pay bills, seek medical attention for themselves, or simply rest from their ongoing care-giving duties. This program provides our clients the ability to remain where they want to be and that is home. The stimulating activities increase our clients’ self-worth and helps their caregivers by providing them with time and an opportunity to be able to maintain their own lives. We have lots of volunteers who enjoy sharing their talents with our clients. Linda Hammonds, an engaging storyteller, is a frequent visitor who enthralls our clients with her outlandish tales and songs. And there is Hero, a friendly pet therapy dog who loves all the attention he receives at each visit. We enjoy lively music from the ETSU Bluegrass Band the ETSU Flute Choir on a regular basis. The program serves families from Carter, Greene, Sullivan, Washington and Unicoi Counties. ADS provides wheelchair accessible transportation as well. Nutritious breakfast, snacks and lunch are also provided each day. Funding sources include TN Department of Human Services, City of Johnson City, Social Services Block Grant, Veteran's Administration, United Way, City and County Governments, Medicaid Waiver Funds, Private Pay, Community Contributions and fundraising activities. ADS is located at 603 Bert Street, Johnson City, in the old Keystone School. We encourage you to visit our facility at any time. We also encourage you to share your time with our clients and volunteer! Please call 423.928.8855 for more information. 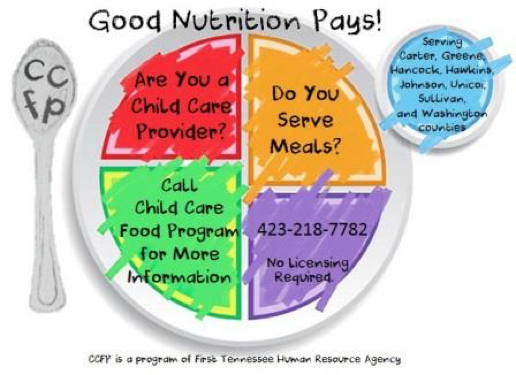 The Child Care Food Program (CCFP) provides financial reimbursement for nutritious meals and snacks served to eligible children enrolled in a participating daycare home. Is your child being served balanced meals each day? Ask your daycare provider if they participate in the program. Who does the Child Care Food Program serve? Your child is 2 weeks to 12 years of age. One of your enrolled, unrelated, day care children is eating the same meal you’re claiming for your own child. Home daycare providers receive monthly direct deposits based on the number of meals and snacks served to each child per day. The rate at which home providers are reimbursed is annually set by the federal government. For any and all inquiries call: Renée Fox at 423-218-7782. The CIGP grants program was created in 2000. Originally it was established as a way to “give back” to other nonprofit organizations within the community. In 2013-2014 this grant was expanded to included, schools, local city and county governments and courthouses. By funding projects within their service area, the mission of the program is to use funds generated by the Misdemeanor Probation Program of First Tennessee Human Resource Agency to build a better community by providing financial assistance for one time program projects and re-investing in the vital institutions within the communities we serve. For more information and the application process please download the PDF. Please leave a message with your contact information if there is no answer. Please allow 24 hours for a return phone call. The Foster Grandparent Program provides volunteer opportunities for people aged 55 and older from all economic, educational, and social backgrounds to serve children and teenagers who have special needs as well as their families. Foster Grandparents help young people increase their self-confidence and achieve personal independence so that they can learn to overcome their problems and become productive members of society. Foster Grandparents volunteer an average of 1,040 hours every year (15 to 40 hours weekly) through local community non-profit agencies in both community-based and in-home settings. Volunteers who meet certain income guidelines receive a small, non-taxable stipend, which enables those living on limited incomes to served at no cost to themselves. Assistance with the cost of transportation, a daily meal, an annual physical exam, and on-duty accident and liability insurance are also provided to all volunteers. To learn how you can become a foster grandparent or to learn more about the program, please call 423-639-8462. The Foster Grandparents Program is funded by the Corporation for National & Community Services and is a division of Senior Corps! Good nutrition is important to everyone and homebound seniors are especially at risk. 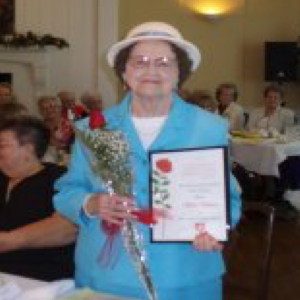 FTHRA's Nutrition Program is partnered with Meals on Wheels to help seniors not go hungry. We provide nutritious meals that meet USDA guidelines for seniors. Wonderful volunteers in all our communities deliver the meals to each person. 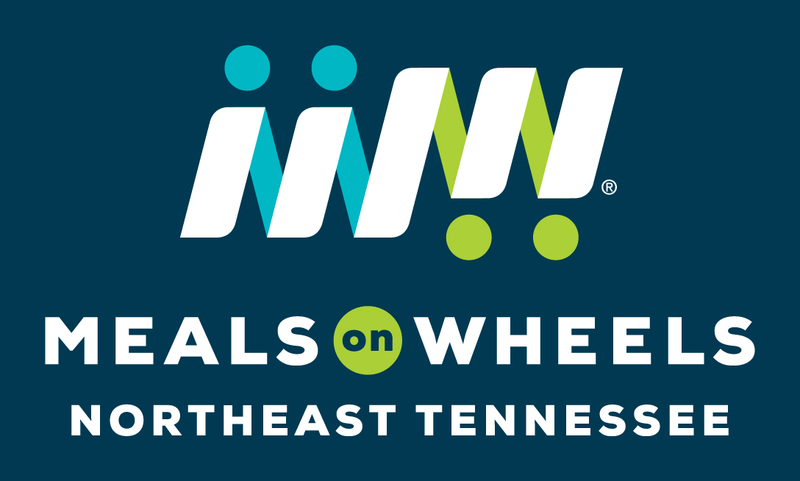 Meals on Wheels is available in Carter, Greene, Johnson, Hancock, Hawkins, Sullivan, Unicoi and Washington Counties. Volunteers are always needed in each of these counties. Volunteers are essential to the program because not only do they deliver a meal to the recipients, often they are the only people the recipients see each day. Everyone who receive the home delivered meals are assessed by Aging and Resource Connection (ADRC). ADRC is a program through the Area Agency on Aging that do an evaluation to determine what services for which the person is eligible. Please call 1-866-836-6678 for more information about eligibility. Private pay is also available if you have a loved one that could benefit from these meals. The cost of the meals for one month is $130. Please call 423-722-5107 for Information and Assistance. FTHRA also provides nutritious meals in a community meal setting. These community meals sites are listed below. Anyone over the age of 60 is welcome to enjoy a lunch time meal. Registration with the meal site coordinator is all that is required (at least 24 hours in advance to ensure enough meals are available). Click on the button below for a printable copy of information for you to share with anyone who may need this service, who may be interested in volunteering or interested in making a donation. NET Trans operates Monday through Friday with limited service on Saturday. We are closed on the following dates: New Year’s Day, Martin Luther King Day, President’s Day, Good Friday, Memorial Day, Independence Day, Labor Day, Veterans Day, Thanksgiving Day, Christmas Day. Personal Support Services (PSS) is the exclusive provider of supportive services for the Department of Human Services’ Adult Protective Services APS. One resource can be a referral to PSS, and we become the “eyes and ears” of the State, on behalf of all citizens, to provide a safer and more secure environment. Under the supervision of a registered nurse and case managers, our highly trained staff provide in home personal care and housework, certain errands, some financial over-site, observe the activities within the house and the status of the client’s safety and well-being. The Alternative Community Corrections Programs and services are designed to divert convicted felony offenders from incarceration by providing intensive supervision and structured rehabilitative services in the community. We work with non-violent felony offenders who require intensive intervention and supervision programs to develop the appropriate social skills required to function within the framework of society. Intensive Supervision – Each offender is placed on a systematic regime of home and employment visits as well as office visits, all of which ensures the offender’s compliance with program expectations. Drug Screening – Each offender is required to obtain and maintain clean drug/alcohol screens throughout the duration of their placement on the program. Moral Reconation Therapy (MRT) Program – An intensive 12-step program that focuses on intensive life adjustments and restructuring of moral decision making skills. MRT Relapse Prevention Program – An intensive 10-step program that focuses on the warning signs of drug and alcohol relapse and teaches tools to combat relapse issues. MRT Support Groups – Graduates of the above programs will attend an open-ended discussion and support group with other graduates in an effort to remain drug and alcohol free and free from re-offending. Mentor Assistant Program (M.A.P.) – In addition to the Support groups, graduates of the MRT program will continue attending current MRT and Relapse groups for the purpose of mentoring those offenders presently going through the program. Community Service Work Program – Each offender is required, if physically able, to provide on average 240 hours service to the community through a series of established non-profit agencies within the local area. Pre-Sentence Investigation Reports – Case officers investigate background history of offenders and supply local courts with written reports to enable judges to determine if assignment to ACCP is warranted. Service Goals – Developing and implementing programs that protect society and meet the varied special needs for felons who are referred to ACCP by the courts. Referral Sources – Tennessee Board of Probation and Parole, local courts, the District Attorney General’s Office, and other community-based correctional agencies. Funding Sources – Tennessee Department of Corrections. Client Fees. Misdemeanor Probation Program provides services and supervision for clients sentenced by local General Sessions and Criminal Courts for various misdemeanor offenses. Programs and services provided by the MPP are designed to divert convicted misdemeanor offenders from incarceration by providing supervision and structured rehabilitative services in the community. Supervision – Trained case officers supervise offenders to ensure compliance with probation rules and orders from the court. Monitoring – Client’s court costs, fines and restitution to the courts in which they were convicted are monitored by the MPP staff. Domestic Violence Programs – Designed to provide facilitator-led group education and interaction for clients referred by the court. Contracted - DUI and Defensive Driving Schools – These schools offer classes necessary under state law for those offenders assigned from the courts. Pre-Sentence Investigation and Reports – Case officers investigate background history of offenders and supply local courts with written reports to enable judges to determine if probation is warranted. Referral Sources – General Sessions and Criminal Court Judges, the District Attorney’s Office and other Correctional Agencies. Funding Source – Client fees. First Tennessee Human Resource Agency’s Senior Employment Program is a federally-funded training program which assists low-income, unemployed seniors gain viable job skills through paid training at various non-profit and government agencies. SCSEP is operated under a USDOL grant and in cooperation with Senior Service America, Inc. The SCSEP Program is an equal opportunity program. Are you an eligible participant? If I am accepted into the program, what will I be doing? Once you have been accepted into the program, you will work with program staff to develop and implement an Individual Employment Plan (IEP) to overcome any barriers you may have for employment. You will be placed in a training position at a “Host Agency” (a non-profit or government agency) and paid minimum wage ($7.25 per hour) for 20 hours a week. You will gain work experience while providing needed services in your community. Program staff will help you with job search skills, interviewing skills, resume creation and other training needs to help you secure employment outside of this program. Your goal will be to secure permanent employment. Contact us by calling 423-461-7844. One of our Job Developers will call you to further explain the program and the procedures for enrollment. Please see the You Tube video featuring Pat Gagan, Park Manager for Roan Moutain State Park. His message is positive and reiterates the wonderful qualities of senior adults in the work place.